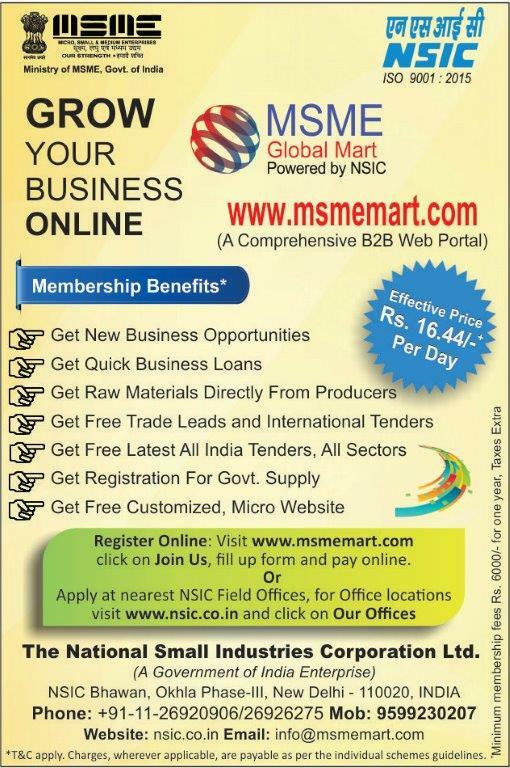 The units registered under Single Point Registration Scheme of NSIC are eligible to get the benefits under Public Procurement Policy for Micro & Small Enterprises (MSEs) Order 2012 as notified by the Government of India, Ministry of Micro Small & Medium Enterprises, New Delhi vide Gazette Notification dated 23.03.2012. Every CentralMinistries/Departments/PSUs shall set an annual goal of minimum 20 per cent of the total annual purchases of the products or services produced or rendered by MSEs. Out of annual requirement of 20% procurement from MSEs, 4% is earmarked for units owned by Schedule Caste /Schedule Tribes. All Micro & Small Enterprises having EM Part-II (Optional)/ Udyog Aadhaar Memorandum (UAM) are eligible for registration with NSIC under its Single Point Registration Scheme (SPRS). Micro & Small Enterprises who have already commenced their commercial production but not completed one year of existence. The Provisional Registration Certificate can be issued to such Micro & Small Enterprises under Single Point Registration scheme with monitory limit of Rs. 5.00 Lacs which shall be valid for the period of one year only from the date of issue after levying the registration fee and obtaining the requisite documents. 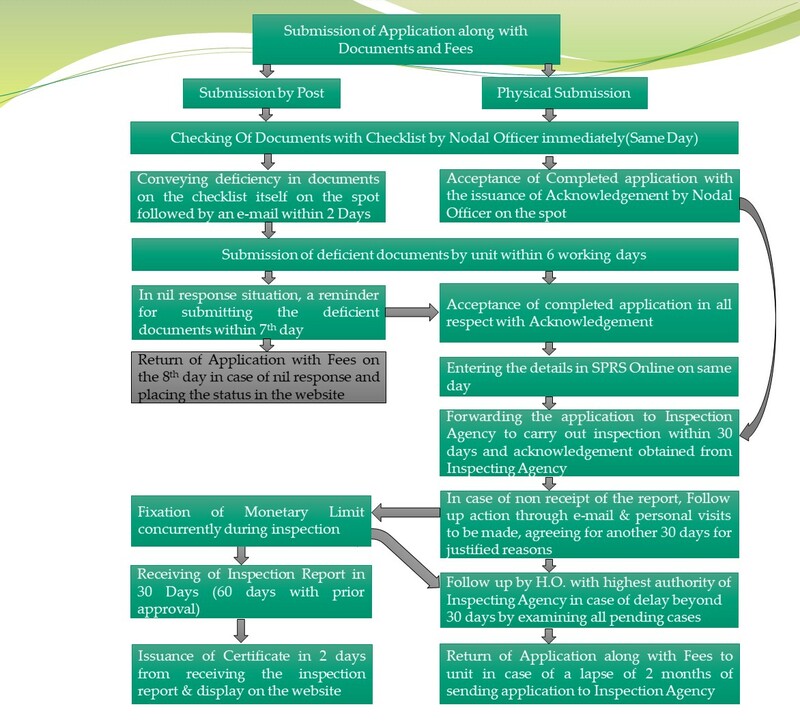 Micro & Small Enterprises may fill up 'Point of Interest' form available at our website www.nsicspronline.com or on the prescribed application form (in duplicate) either to be downloaded from website or avail from NSIC offices along-with requisite fee and documents to the Zonal/Branch/Sub Branch and Sub Office/Extension office of NSIC situated nearest to their location. Duplicate copy of the G.P. Registration Application Form submitted by the Micro & Small Enterprise will be forwarded to the concerned Inspecting agency along with copies of required documents and requisite Proof of inspection charges remitted in favor of concerned Inspection Agency requesting for carrying out the Technical Inspection of Micro & Small Enterprise and forward their recommendations in this regard. After receiving Inspection Report, NSIC will issue the SPRS Registration Certificate to Micro & Small Enterprise for items/stores as recommended. REGISTRATION FEE:The registration Fee is based on the Net Sales Turnover as per latest audited Balance Sheet of the Micro & Small Enterprise for the Registration, Renewal and any other amendment etc. For detailed fee structure please see the Document section. The Registration Fee is mentioned in the Document section is excluding the Inspection charges. For details of inspecting agencies and their fee please see the Document section. List of Empanelled Inspection Agencies with complete Fees structure can be downloaded from below DOCUMENTS section under link "List of Empanelled Agencies along with Inspection Fees"
The Registration Certificate granted to the Micro & Small Enterprise under Single Point Registration Scheme (Revised), 2003 is valid for Two Years and will be reviewed and renewed after every two years by verifying continuous Commercial and Technical Competence of the registered Micro & Small Enterprise in manufacturing / producing the stores for which it has been registered by NSIC. Please refer below list for documents and downloads.